Turkmenistan is one of the most restricted countries in the world. Since the fall of the USSR in 1991, Turkmenistan has developed into a strict dictatorship. Former President Niyazov led the country until his death. When he rose to power in 1985, he called himself the “Turkmenbashi” (father of the Turkmen) and proclaimed himself president for life. He created a cult of worshipers of himself at the expense of the state, and took away most of his own citizens’ rights and freedoms. Thus, the state of children’s rights is a cause for concern. 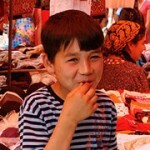 50% of the population in Turkmenistan lives below the poverty line. The living conditions for Turkmen have only gotten worse since the country gained independence. Turkmenistan’s economy depends largely on mining natural gas (the 5th largest reserve in the world) and drilling for oil. Turkmenistan is also the 10th largest producer of cotton in the world. It is very clear, however, that the advantages gained by these operations are not used to benefit the general populace. The highest government officials hold a monopoly on the industries. 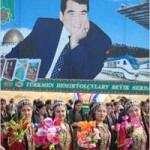 The education level of the Turkmen population has declined considerably since Turkmenistan declared its independence. Education is free for all children. However, children in remote areas often do not have access to a school. Even though the Turkmen education system shares aspects of the system which had been established by the Soviet Union, the current government decided to instate changes so that children could attain a higher level of education. Primary and secondary curricula are being restructured according to Western models. The Latin alphabet has been reintroduced, so that the Arabic alphabet is not the only one learned. 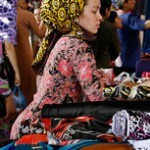 Classes are taught in Turkmen, Russian, and English. The government hopes that these changes will produce competent workers and give the country an opportunity to become a global player. As part of the education system’s reorganization, former President Saparmurat Niyazov, who died in 2006, instated his book, called the “Ruhnama,” as the mandatory – and only – academic book. The president said that this book was “born in his heart through the will of the Almighty.” He decreed that all Turkmen people must follow all the book’s principles to the letter. 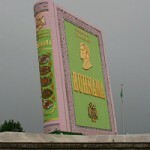 He also had the Turkmen imams give the book an equal status with the Koran, the Bible, and the Torah. The Rukhnama became the main subject of the country’s education system. Students from junior high through college had to memorize passages from the book. The Rukhnama’s establishment as the foundation of the Turkmen education system has skewed the system so much that experts have major concerns about how much the quality of education has suffered, and even about the future of the Turkmen nation. The current system has basically created a generation whose knowledge is limited to the biography of President Niyazov. The International Crisis Group published a report in 2005 which revealed the impact that the cotton industry has on children’s rights. The report revealed the ultra-strict working conditions for children in the cotton fields. Rural schools close every year during the harvest (September to December). Students and all other children are forced to work in the cotton fields without payment. 85% of the population in Turkmenistan is Turkmen. The rest are ethnic minorities: Uzbeks, Kazakhs, Armenians, Ukrainians, Tatars, and Azerbaijanis. 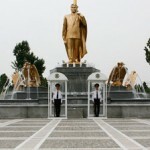 President Niyazov’s reign brought the “Turkmenization” policy that trampled over the rights of the minority populations. The former president wanted to sever historical ties with the ex-USSR and give his country a “Turkmen face.” In order to do so, he decreed Turkmen as the country’s official language, even though the Constitution stipulates that all former USSR languages should be treated equally. 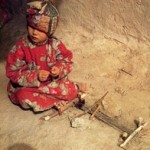 Minority children, as well as adults, must learn Turkmen and favor its use over their native language. Most schools which taught in languages of ethnic minorities have closed. It falls to the parents to instruct their children in these languages. The treatment of these ethnic minorities is even worse. They are seen as second-class citizens and social outcasts, and are constantly discriminated against. They don’t have access to the same quality of education as Turkmens, so their chances of being admitted to a university are slim, which excludes them from many work industries. 89% of the population in Turkmenistan is Muslim. Religious minorities are not officially recognized by the government. Amnesty International reports that many ethnic Turkmens who profess to a different faith than the official religion have been forced into exile or transported against their will to a different region of the country, where they have been abused and tortured by the police. 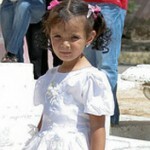 Arranged child marriages are common in Turkmenistan as they ensure good relations between the two families. The father receives a dowry of money, camels, or sheep. Sometimes, fathers will marry off their daughters in order of age. Once they are married, young girls belong entirely to their new family and are expected to become pregnant within the first year of their marriage. These forced marriages are clearly a violation of children’s rights for two reasons: first, because the children usually have not reached the legal age for marriage; and second, because this practice denies children the freedom to make their own decisions about their future. Unfortunately, in Turkmenistan as in many other countries, arranged marriages are deeply rooted traditions and are difficult to overcome. Although the Turkmen health care system theoretically provides free access to health care for all citizens, it’s not quite so effective in practice. The inefficiency of the system affects children the most. The high rate of infant mortality (45‰) is mostly due to malnutrition, a poor health care system, domestic violence, and a lack of hygiene. Existing doctors usually have poor qualifications and little access to basic medicine, let alone to adequate medical equipment. The medical infrastructure is quite defective and showcases the inefficiencies of health care services. Moreover, people in rural areas do not have access even to this limited health care. Because of the poor quality of health care services, many Turkmens look to traditional medicine, such as herbal treatments and prayer. A growing number of young girls in Turkmenistan turn to prostitution in order to fulfill their own needs. It’s as common to see schoolgirls selling their services to men in the streets in urban areas as in cotton producing regions. Some parents go so far as to set up brothels in their homes and offer up the services of their own daughters.